When I first came to San Diego, I knew Coronado was one of the must-see areas of the city. It is a beautifully put together area of San Diego, and this small island is bursting at the seams with character and charm. As you cross over the Coronado bridge from the I-5, you are met with a stunning view of the island, ocean, downtown San Diego, and Point Loma off in the distance. Coronado is some of the most sought-after and exclusive real estate in all the city due to it’s quiet neighborhoods and prime location near downtown and the ocean. Homes and condos are limited due to a large portion of the island being home to both the Naval Air Base – North Island and the Naval Amphibious Base. This interesting mix of military meets high class suburbia sets Coronado apart from other beach areas in the city. Coronado has a very particular small town feel while remaining incredibly close to everything. It is a favorite tourist destination because you can walk from one side of the island to the other (assuming you don’t mind a bit of a hike), and there is no shortage of activities to enjoy. Festivals and fairs are commonplace in the parks, the roads are always decorated beautifully with flowers and shrubbery, and people are friendly and helpful. Because of the exclusive nature of real estate in Coronado, the homes and condos tend to be meticulously maintained. If you are looking at property in Coronado, it will often be high quality because the residents would expect nothing less than perfection. No matter where you purchase in Coronado you are never far from the beach or bay. Read through the details below, or use the quicklinks above to skip directly to sections of interest to find out more information about the charming city of Coronado! According to the Coronado Historical Association, Coronado’s unique history began in the seventeenth century when Sebastian Vizcaino, a Spanish explorer, discovered a group of islands and called them Las Yslas Coronadas. They explored San Diego and Coronado but for nearly 200 years, no development took place. Coronado was initially used as a home base for Spanish whalers. After the peninsula was traded several times, it finally settled in the hands of Elisha S. Babcock, Jr., Hampton L. Story, and Jacob Gruendike, who had plans to turn it into a beach resort location. 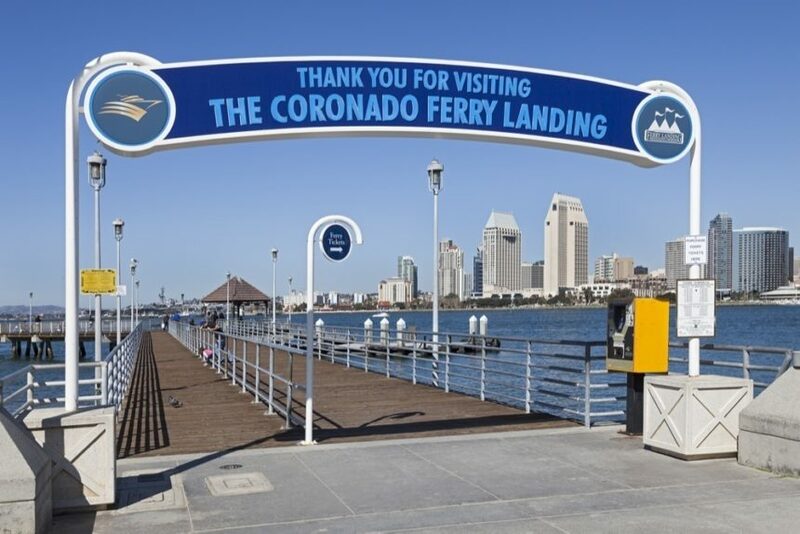 After general infrastructure was in place, they created the San Diego and Coronado Ferry Company which still runs today. Coronado is rich with military history, which is still a characteristic that defines it today. In 1911, a man named Glenn Curtis created an aviation camp, which is now known as “North Island.” During World War I, it was sold to the Navy. Another piece of interesting history, in 1927, Col. Charles Lindbergh took off on his journey to St. Louis from North Island. Currently North Island is one of the biggest Navy employers in San Diego and it’s home to two impressively large aircraft carriers. On the other side of Coronado, right at the beginning of “the Silver Strand” lies one of the most captivating military bases in San Diego, the Navy Amphibious Base which is a powerhouse for special warfare training operations. Home to over 5,000 military personnel and 7,000 students reservists, NAB Coronado is a pinnacle in the community. The base provides training for the infamous Underwater Demolition Teams (UDT) and SEAL teams. Often Coronado residents can see the infamous SEAL training appropriately named, “Hell Week” being performed on the beaches along the Strand. Named officially as the “Birthplace of Naval Aviation” in 1963 by resolution of the House Armed Services Committee, North Island Naval Base in Coronado has and continues to be an innovator and driving force in our military’s aviation requirements. One popular pastime of native San Diegans is to lay out on Coronado beach and watch the aircraft fly by. You can watch as a variety of military aircraft land at North Island and provide beach goers with a free airshow. Air Force One has even touched down there for presidential visits. Coronado is often referred to as an island, but it is actually a peninsula. On one side you have part of Coronado facing the beautiful San Diego Bay, and on the other side, you get sweeping views of the Pacific Ocean. Coronado’s main street is known as “Orange Avenue” which will take you through the heart of the city. There has been a recent boom with many new restaurants and cafes opening up, along with a recently renovated old-style movie theater that now offers showings of new releases. Along Orange you will find Spreckles Park, which is home to weekly art shows and holiday fairs. There are many side-streets that will veer off towards residential neighborhoods and Navy housing. If you head down Orange Avenue to the South, you will find yourself going past the Hotel Del, the Naval Amphibious Base, and onto the famous “Silver Strand” whose name derives from being next to the world-renowned “Silver Strand State Beach.” Keep going and you will hit Imperial Beach (zip code 91932) and then eventually you will hit the Mexican border. 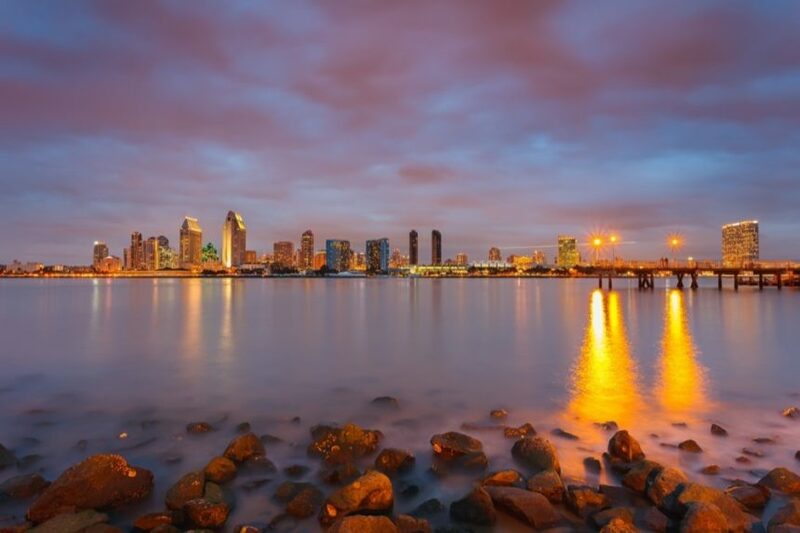 On the bay side of Coronado you will find restaurants with breathtaking views, paths to walk along, and great areas for taking pictures with a San Diego cityscape backdrop. 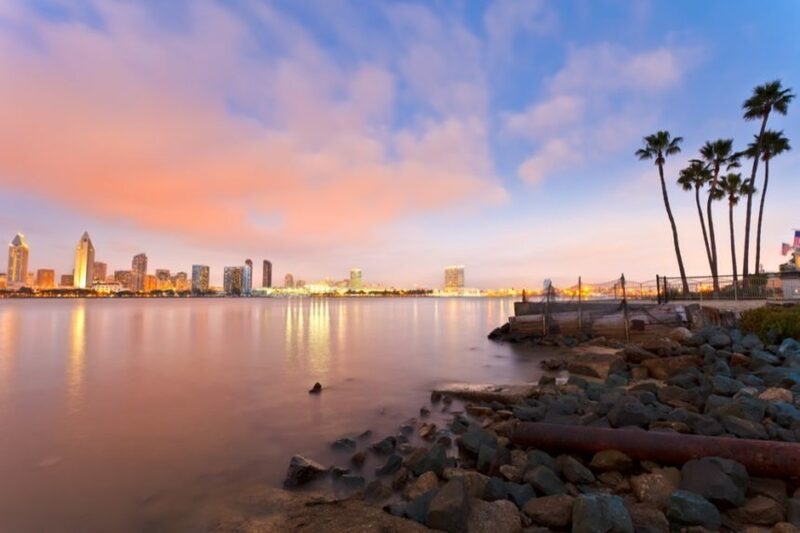 Coronado is conveniently located across from downtown San Diego. You can jump on a ferry to take a memorable ride across the bay, or shoot across the iconic Coronado Bridge and hop on the I-5 to get where you need to go easily. The easy accessibility to both the city and the ocean is just one of many reasons why Coronado is a great place to live. Coronado is a mix of single family homes and condominiums that tend to cluster around the bay, beach, or Orange Avenue. Home styles range from traditional coastal style homes to Spanish-inspired Mediterranean villas. There are nice collections of craftsman style homes that still have that bungalow feel, not uncommon in Mission Hills or North Park. Even with much of the town sticking to a very clean look with a traditional feel, you can find something for everyone in Coronado real estate. Coronado has some of the most outstanding views of the city. Depending on which side of the island you are on, you have beautiful views of Point Loma, San Diego’s skyline, San Diego bay, the Pacific Ocean, Coronado Islands, and even Mexico. Many of the taller buildings in Coronado are generous with window size so you can take in the gorgeous views. There are not many large or tall buildings in Coronado, which is good news for those looking to purchase a home with multiple stories. Coronado has a lot of building restrictions and strict permit requirements so the odds of someone building something to block your view is far lower than in other prime real estate areas. If you are facing the bay, you can enjoy watching a variety of sailboats, military ships, and civilian boats pass by. One nice aspect to the bay views is that you can still enjoy them at night, whereas ocean views tend to black out after dusk. Whether you want a sweeping view of the ocean, or a backdrop of San Diego’s downtown, you can get what you want in Coronado. Even if you are looking to purchasing a home that is one story with limited or no views, Coronado has the unique characteristic that you can ride your bike or walk to the bay or beach in a matter of minutes. So while you may not get as good of a view if you live more centrally on the island, you can just walk out of the neighborhood and still enjoy the view of your dreams. Homes without views tend to enjoy the benefit of lower price tags as well. Due to Coronado’s limited building space, it is one of the most exclusive areas to live in San Diego. While many people are hesitant to use the word “recession proof”, Coronado very finite footprint tends to protect property values. Home values are always above San Diego’s median and those who live in Coronado, stay in Coronado, so many homes that come to market are snatched up fast. Below, you’ll find a graph showing the median sales prices of homes in Coronado. The data reflects the last three years and it is automatically updated to be current. When doing a comparative market analysis to determine the estimated value of a home in today’s market, the price per square foot is often a key component of this analysis. An agent or appraiser will typically take the price per square foot range, (arrived at by selecting recently sold properties that are comparable to the subject property), and then multiply that price per square foot by the number of square feet in your home. Price per square foot can vary dramatically for certain homes, but the figures are still an excellent way to gauge the value of a property. Below, you’ll find the average price per square foot, again taken over the last three years. Remarkably, Coronado has neighborhoods that double, triple and almost quadruple the average price per square foot of homes through San Diego. Single family homes in Coronado start at about $800,000, however most are $1.2 million and up. Detached homes under $1 million are not only rare, but are generally quite small (under 1000 square feet). Homes below $2 million tend to be towards the inland, bay side of the island and prices progressively increase when you’re close to the Pacific or the waterfront facing downtown. The median sales price for homes in Coronado CA for Oct 14 to Jan 15 was $1,300,000. The majority of homes in Coronado are in the $1-3 million range. If you are looking for an ocean view, be prepared to spend anywhere from $3-$20 million. While the prices in Coronado may be higher than other ocean-side communities, you are paying for a very exclusive location, convenience, and the undeniable beauty and charm that Coronado possesses. Condos in Coronado are more affordable comparably to the single family homes of the area. Condos start off roughly in the $700’s for a 2 bedroom and can easily enter the $1-3 million range depending on location on the island, desirability of the property, etc. Median pricing for condos and townhomes in Coronado is around $865,000 as of January 2015. Condos more inland tend to be in the lower price points. Condos are even more scarce than homes in Coronado, so don’t expect bargain pricing you can often find on condos throughout greater San Diego. It is indeed often a seller’s market on the island. Most of the condos tend to cluster around Orange Avenue, the bay or near the Ocean. The Coronado Shores towers are definitely the most prominent condos in Coronado. This collection of ten high-rise buildings sits adjacent to the Hotel Del Coronado and has some of the best views in the city. There are units that face the bay and those with vast, unobstructed ocean views. There are also smaller condo buildings that line Orange Avenue that may give better walkability or a ‘city feel’ while remaining close to the beach. 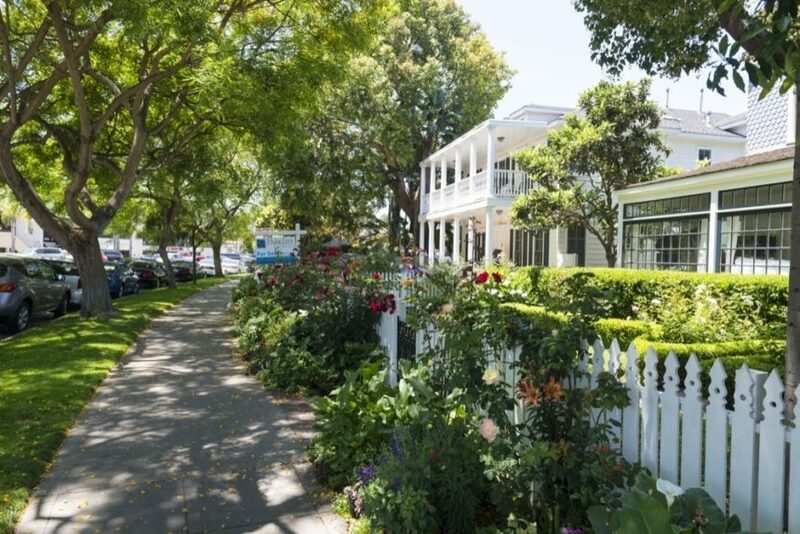 Walkability in Coronado is pretty high as long as you are close to Orange Avenue. Most of the shops, restaurants, and entertainment are at the core of the city. Biking or driving would be a preferred means of transportation if you want to live deeper in the residential neighborhoods. There are many small cafes, wine tasting rooms, and even a theater that are all within easy walking distance once you get to Orange Avenue. You also have the option of walking to the ferry and taking the ferry to downtown if you wanted to change up your routine. This small park is next to the Coronado Ferry Landing and Ferry Landing Marketplace full of sit down and casual restaurants. The well-known seafood establishment Peohe’s is located here as well as the great Italian restaurant of Il Fornaio Coronado. If you are looking for something less formal, you have the option of Lil’ Piggy’s BBQ as well as Spiro’s Gyros. More restaurants detailed below. 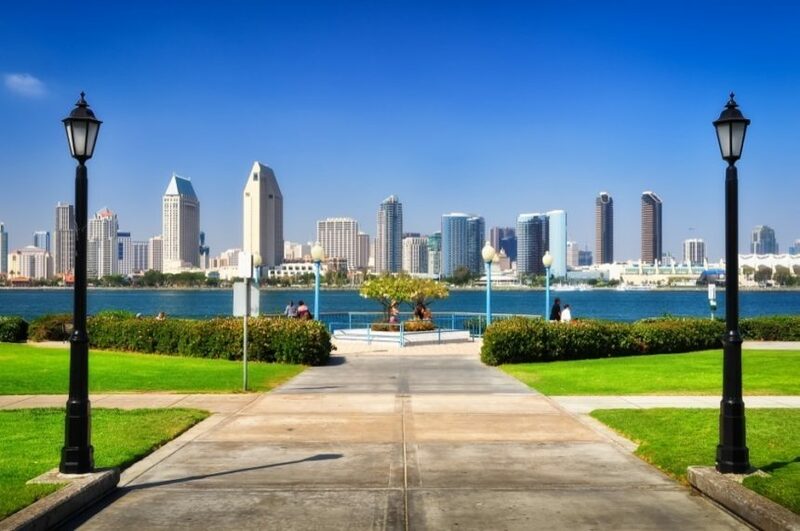 At Centennial Park you will find a stunning view of the bay and San Diego cityscape. There is a sidewalk that runs just along the bay that residents often use for walking, jogging, or photo opportunities. There is also ample affordable parking that is free with validation from any of the shops located in the marketplace. A small tranquil park nestled between residential housing. It has several benches by beautiful trees that overlook the bay and San Diego’s downtown. This would be a perfect location if you wanted to admire the bay but get away from the busyness of Centennial Park. Known to local residents as the epicenter for Coronado culture, this park is where a large majority of Coronado events are held each month. It is not surprising to see art fairs, concerts and community-run events in this gorgeous shaded park. There is a playground located on the east side of the park, benches, picnic tables, and ample street parking. There also are restrooms on site, which make this overall one of the most well-rounded and family-friendly parks in Coronado. This simple yet drop dead gorgeous park sits along Ocean Boulevard next to the Sea N Air golf course. A wide-open grassy space with a lovely view of the ocean gives children (and parents) a picturesque backdrop to play. A playground is located on-site along with benches for parents to sit and enjoy the salty air. Because this park is located towards the end of Ocean Boulevard traffic is less of an issue, although parking is difficult to find during the weekends. Arguably one of the best dog beaches in the world, Coronado offers a slice of its amazing beach to man’s best friend. Here you can let your dog off-leash and allow them to frolick in the waves, sand and sun. There are no fences so it is important that your dog be properly trained to not run outside of the parameters of the beach. Otherwise you not only risk the safety of your pet, but also may face some hefty fines. The area’s largest park, it offers bike paths, playing area, and open fields right along the bay. Modern art sculptures dot the pathway. There are picnic tables so you can enjoy a gorgeous lunch with a waterfront view, or a romantic sunset dinner. The bike path stretches from the Silver Strand to the Old Ferry Landing, which gives you the great opportunity to see Coronado from one side to another. It is one of the few waterfront parks in San Diego that offer permits for large events such as birthdays and weddings. Because Coronado is an island (well, peninsula) there are not many ways to leave that don’t involve a boat or swimming. The majority of people leave over the Coronado Bridge and during rush hour it can become congested. If you are trying to leave Coronado, you can take a shortcut to the bridge by going along Pomona Avenue along the picturesque golf course. In cases of severe traffic, you do have the option of heading down the strand and taking a detour through Imperial Beach to the I-5. Overall traffic is not out of the ordinary for Southern California, but you can experience an increase during the summer due to tourists. 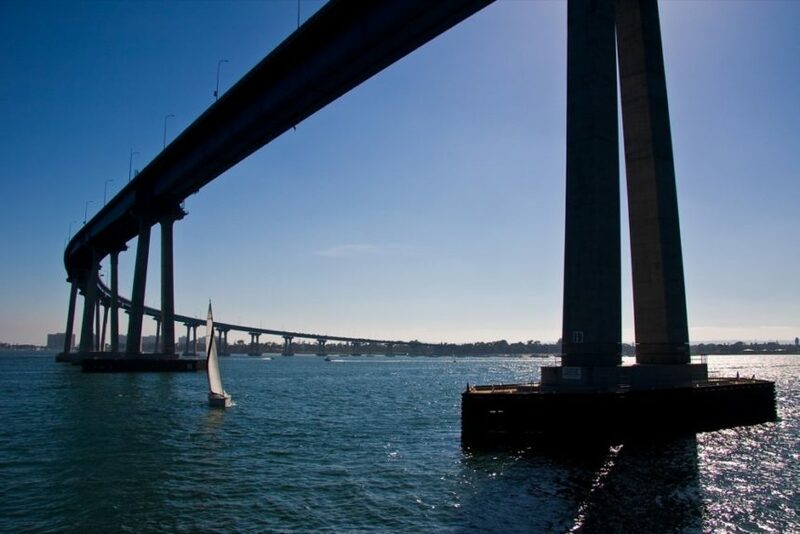 The Iconic Coronado Bridge is one of two vehicular routes on and off the island. Due to the large military bases on Coronado, there can be some traffic issues around both North Island and NAB Coronado. The traffic getting into the bases are mainly early in the morning (7-8am) and in the afternoon (2-3pm). Outside those timeframes, the military bases do not typically impact traffic significantly. Commute times to downtown San Diego are outstanding. When you get over the Coronado Bridge, you can be downtown in less than five minutes. You also have the option of taking the ferry downtown and walking to your office, no car needed. Most of Coronado offers easy, quick access to the I-5, which can bring you to North County in 25 minutes, or South County in 15 minutes (or longer during higher traffic periods). The 94 is just one exit after the Coronado Bridge which will take you just about anywhere you need to go in East County. Part of the appeal of Coronado is you can experience a beach community and still be close to everything great in San Diego. There are five schools in the Coronado Unified School District Coronado has some of the best rated schools in San Diego. Private schools include Christ Church Day School (K-6th grade) and Sacred Heart Parish School (K-8). 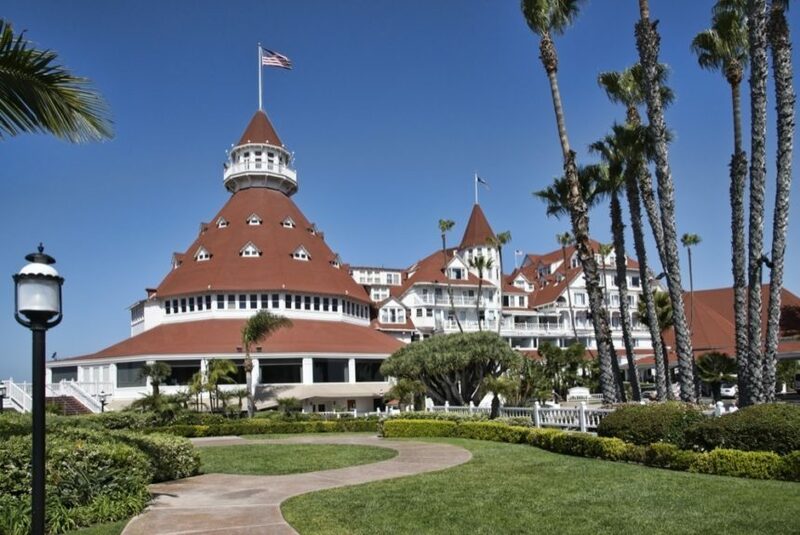 The Hotel Del is the most historical site on Coronado Island and probably the most defining landmark of the area. Built in 1888, it was the first beach resort on Coronado and has maintained its traditional wooden Victorian style today. In fact, it is the second largest wooden structure in the United States. It has served many famous patrons such as US Presidents from McKinley to Obama and many celebrities from as far back as Charlie Chaplin to more recently Brad Pitt and Oprah Winfrey. One of the most interesting facts is that L. Frank Baum, the author of The Wonderful Wizard of Oz did most of his writing while staying at the Del. It is said he got the inspiration for the Emerald City from the whimsical architecture of the Del. The Del offers walking tours, and events throughout the year, in addition to being a popular location for weddings and other large events. San Diego is a prime location for sportfishing. One of the most popular areas to catching tuna, there is a bustling sportfishing community in Coronado. San Diego Bay is home to game fish such as halibut, barracuda, bonefish, bonito, corvina, yellowfin croaker, bass, in addition to a variety of sharks and skates and many more. All you have to do is purchase your fishing license and there are many companies willing to take you out to the best-known areas. Even if you are unlucky, it’s a beautiful location to take in the sights and be on the water. Coronado is not short on boats or yachts. Due to its prime location between the bay and the ocean, boating is ingrained into the Coronado culture. The Glorietta Bay Marina includes a recreational vessel rental and public access dock component operated by Seaforth Boat Rentals. With Seaforth you have access to the dock as well as the option to rent a variety of boats along with training classes if needed. There are also “dock and dine” opportunities for boat faring folk who wish to stop in Coronado for a quick bite before they go on their way. You can even rent kayaks, Stand Up Paddleboards and paddleboats. Whatever you pick, you will be happy with the beautiful Coronado views and cool Pacific Ocean breezes. You may notice that a lot of people in Coronado get around by bike. There are several areas that you can purchase or rent bikes to see Coronado. Holland Bikes off Orange Avenue has a nice selection of rentable bikes. Wheel Fun also has surreys, specialty bikes, cruiser bikes, and tandem bikes to fit whatever mood you want to cruise with. They even offer Segway rentals. Biking around the island is a great way to enjoy the weather, and all the great views Coronado has to offer. You can get a taste of Italy in Coronado with the Gondola Company’s romantic Gondola cruises. An authentic gondolier gently guides you through the Coronado Cays while you enjoy the beautiful views and gentle breezes. Gondola cruises last for 50 minutes and you can bring your own beverage with you. You can also upgrade to have a mandolin or violin player serenade you on your romantic gondola ride. Perfect for proposals, anniversaries, or just a surprise romantic night out, Gondola Company provides yet another unique adventure you can experience in Coronado. Summer concerts in Coronado have been a tradition for over four decades. The concerts are held from the end of May to September and attract San Diegans from all over the city. You can picnic with friends and family and enjoy the great music. The concert is free to attend, they do ask that you do not set up until after 3pm so people can enjoy the use of the park prior to the concert. While the 2015 calendar has not been released yet, you can find more information on their website. concert schedule for 2015. This is a time-honored tradition that has been going on for over 43 years. The boating community in San Diego decks out their boats with creative Christmas lighting and does a cruise from Shelter Island to Coronado Ferry Landing. You can stand along the bay and watch the fantastic boat parade each Decemeber. Typically around 80 boats participate and try to outdo each other with impressive holiday light displays. They hold the parade on two consecutive Sundays each December. For more details on the San Diego Bay Parade Of Lights Official Website. Coronado has a very rich theater and creative arts community. It would only make sense that they hold one of the biggest film festivals in Southern California. As homage to the glitz and glamour scene that exudes from the Hotel Del, the Coronado Island Film Festival brings film admirers from all over. The next film festival is scheduled to be January 15-18 in 2016. More details at Coronado Island Film Festival Official Website. One thing that catches the eye of most visiting the Crown Jewel of San Diego, are the beautiful flower arrangements that are meticulously maintained around the city. The flower show has been a source of pride in Coronado since 1922. The Coronado Flower Show is held every year on the third weekend of April in Spreckels Park. The Coronado Flower Show is the largest tented flower show in the nation. There are stages for presentations, entertainment, and awards. Admission is just $5 and free to children and Coronado Flower Association members. More details at CoronadoFlowerShow.com. Every year Coronado goes all out on Independence Day. A patriotic parade is the main event that marches down Orange Avenue at 10am. There is a 15K/5K Run-Walk at Tidelands Park, Rough Water Swim at Coronado Beach, Concerts in Spreckles Park and you can end the day with one of the biggest firework shows in the nation over San Diego Bay. 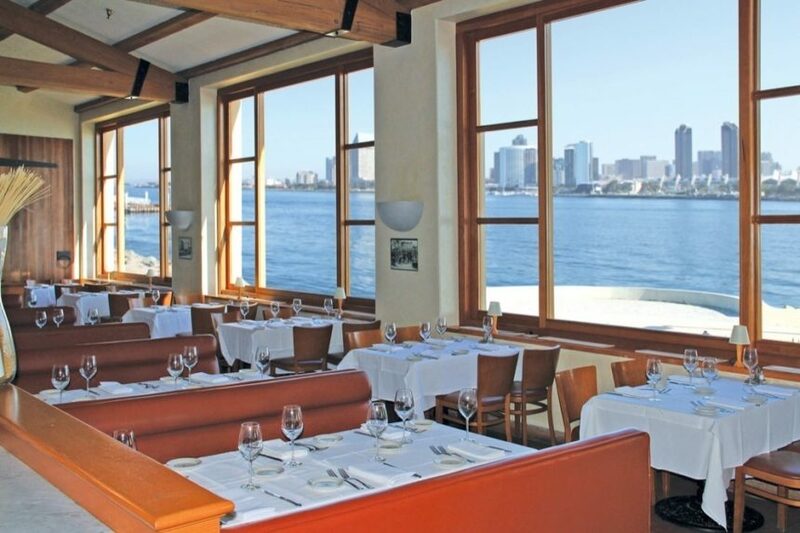 – A seafood experience right on San Diego Bay with top-notch cuisine and formal-dining feel. – One of the most popular brewing companies in town. In addition to an excellent selection of frosty beers, this place has some nice food as well. More casual than other places in town. 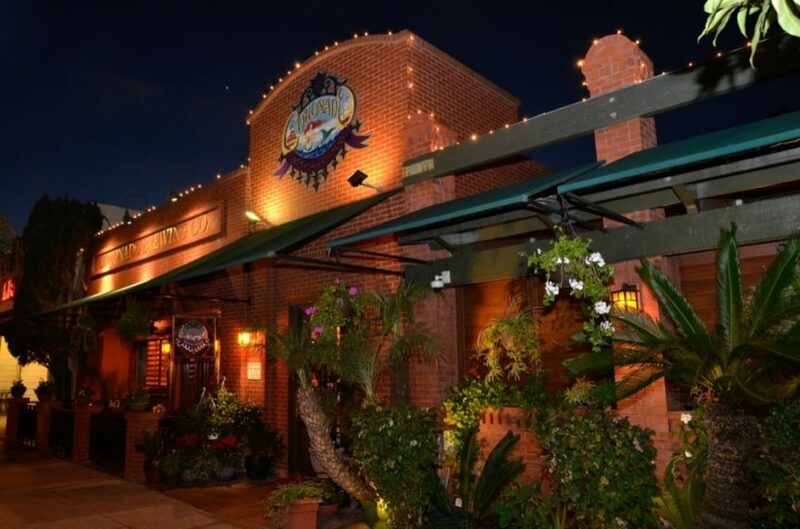 – Home of some of the best margaritas in Coronado. Good Mexican food right near the Hotel Del. – A fun family BBQ restraint right near the Ferry Landing. – Known for some of the best fish tacos on the island. – One of my favorite Italian places in San Diego. Homemade pasta and gorgeous bay views. – Delicious and refreshing gelato in the heart of Coronado. – One of the popular burger chain restaurants offers a place to grab a quick bite before heading to the beach. Their burgers, fries and shakes are a personal weakness of mine. – One of the only places to get sushi in Coronado. Tasty rolls and a fantastic happy hour. – This farm to table restaurant offers fresh and eclectic meals from locally-sourced produce. – A great little pizza place just a block from the beach. Excellent for a slice after enjoying a day in the sun. – Old world style Italian cuisine with an impressive wine selection. – If you are looking to splurge, Sheerwater is the Hotel Del’s formal dining restaurant. It features local seafood, smoked meats, and fresh salads along with a Sunday brunch bar on the weekends. – Charming hole-in-the-wall diner with great breakfast foods. “The Village is located right in the heart of Coronado. The great thing about living in The Village is that you are close to pretty much anything you would like to do. 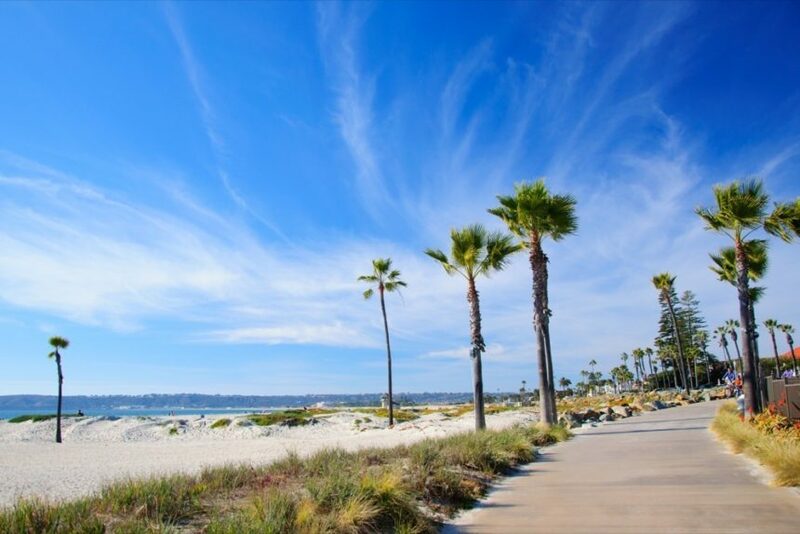 The amenities and attractions of Coronado are all within easy reach. You can walk or bike to the beach, the bay, shopping, dining, schools and parks. Coronado is one of the safest communities in San Diego, so no matter what time of day it is you’ll see people at ease walking around the city. Due to Coronado being a large tourist destination, The Village is the area of Coronado with the most bustle and energy. 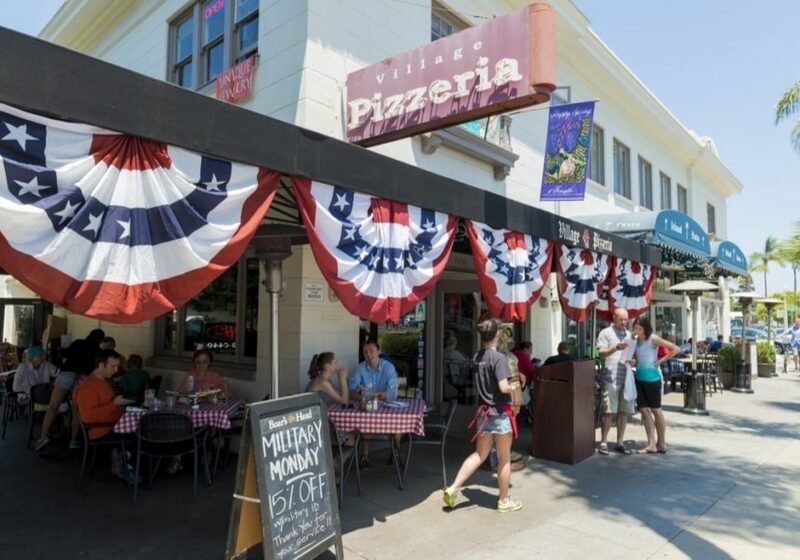 For shopping, dining, and beach-city living, The Village has it all. The Shores makes up of the small area of Coronado, not surprisingly, right next to the beautiful beaches. The Shores is a group of ten large condominium buildings right next to the Hotel Del and right before you reach the Silver Strand. 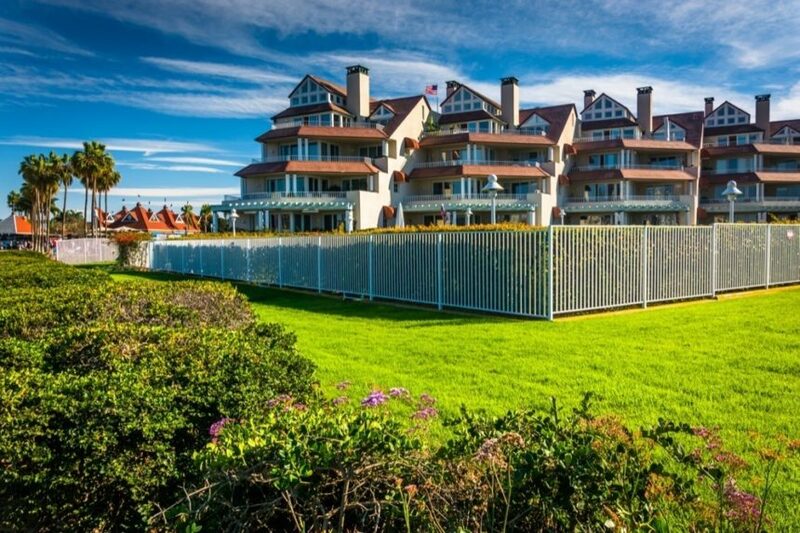 Residents enjoy both the gorgeous bay views on one side and sweeping ocean views on the other. The Shores offers a 24 hour doorman service, pools, tennis courts, and parking for its residents. You also have the benefit of being a short walk from the heart of town giving you limitless options for social activities. “The Cays are a neighborhood about ten minutes from The Village and they offer a quiet, very exclusive neighborhood feel. Many avid boat enthusiasts live in The Cays for the unique benefit of being able to dock close to home. Many properties have their own private docks. Smaller neighborhoods such as Green Turtle and Blue Anchor have homes directly on the bay. This is a highly sought after neighborhood. The Cays also has a private yacht club. The neighborhood contains two family parks including a dog park for those four legged family members. Members of the neighborhood also have access to community pools in the summer. Overall The Cays offer a prestigious residential environment with all the benefits of being close to the water. If you’re ready to explore selling or buying a home or condo in Coronado, please contact me via the form below or the contact information at the top of the page. I look forward to working with you!